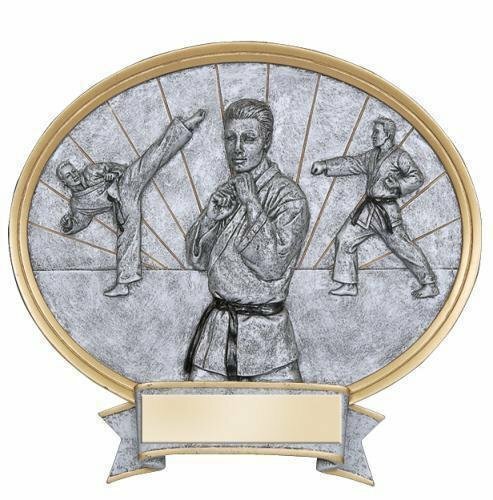 The Karate Impact Award includes a brushed silver plastic plate with up to 3 lines of black laser engraved letters. Lots of action is packed into these Legend Karate Awards. Several elements in the award are raised providing a 3-dimensional look. Several Black Belts are depicted in a variety of different combat positions or stances. These oval awards are available in male or female versions and measure 8 1/2" X 8". A large area at the bottom of the award can accommodate your personalization needs while the gold and pewter finish complement the look of the award. This item can either be hung on a wall or placed on a desk using the included stand. 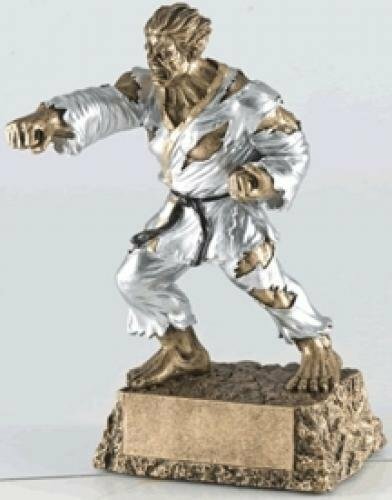 The Karate Monster resin trophy has big muscles and intense expression. Kids will love it or be scared of it. So be sure to ask your parents how their child will respond before ordering. It comes with a brushed gold plate with black laser engraved letters. This Female Martial Arts Bobblehead resin award is arguably the most adorable bobble head on the market. It comes with a brushed gold laser engraved plate. 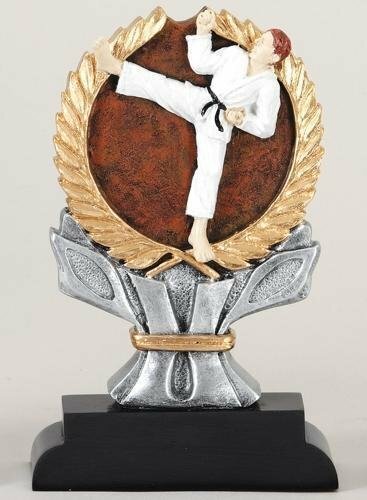 This Male Martial Arts Bobblehead resin award is arguably the most adorable bobble head on the market. It comes with a brushed gold laser engraved plate.